--First of all, thanks for all of the emails regarding yesterday's post. My inbox is already overflowing with mail for the next "mailbag". So it looks like that will be a regular feature. --These nights with two games going on are tough. First I had the Pitt/Penguins combos to deal with. Now I'm faced with the Penguins/Pirates quandary. My channels were changing so often, I thought Xavier Nady was playing on Jordan Staal's line. It was confusing. And the Pirates ended up outscoring the Penguins. --The Pirates started the season 2-0 after downing the Astros, 3-2, for a their second come-from-behind victory of the young season. We were treated to watching George H.W. Bush behind the plate the entire game, which may or may not be an upgrade from a view of Kevin McClatchy for three consecutive hours. Adam LaRoche, in the words of Joe Namath, is struggggling. 0-for-8, 5 strikeouts, 5 runners left on. Of course, being a blogger, my job is to criticize Dave Littlefield if he were unable to trade for LaRoche, then criticize him after two games if the guy is off to a poor start. So direct your anger at the GM. 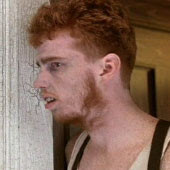 Even worse, I figured out who LaRoche looks like...the Klopek kid from one of my favorite movies of all time, The Burbs. Other than Hans Klopek starting the year hitless and George Bush watching the game, the story of the night was Ian Snell's 11 strikeouts, including future HOFer Craig Biggio thrice. Good thing the Pirates didn't turn him into a reliever after all. --Our daily Don Kelly news alert...Lanny and Wehner were discussing how "starting the season in Houston was a great thing for Don Kelly" because of all the distractions that await him in Pittsburgh. Honestly guys, was Don Kelly's psyche really a concern going into the season? After yesterday's mention, I received a lot of pro-Kelly email. Local guy, Mt. Lebo/Point Park, hard worker...a nice story in the making. --An update on "Club 21", the PNC Park bar to honor Roberto Clemente...it's been renamed "Club 3000", in honor of Bernie Mac's turn in the film Mr. 3000. Seriously though, it's named Club 3000 in honor of all of the Pirates who have 3000 hits. So do they plan on honoring Barry if he can manage 158 more hits in his career? --Brad Lincoln continues the curse of Pirate 1st-round pitchers with the news that he's having Tommy John surgery, done (of course) by Dr. James Andrews. Lincoln becomes the 6th Pirate 1st-round pitcher to have major arm surgery, joining Bryan Bullington, Sean Burnett, John Van Benschoten, Bobby Bradley, and Clint Johnston. --The Pens dropped a 4-1 decision to the Buffalo Sabres, in a loss that significantly raises the chance that they will finish second in the Atlantic Division and fifth in the conference. Just two more regular season games remain for the Pens: Thursday at Ottawa, and Saturday against the Rangers. Going into the playoffs, my big question is whether or not Crosby, Malkin and Staal are capable of growing playoff beards. --DJ Gallo, one of my favorite writers, gives us a 6-part "MLB 2007 Calendar" with his trademark style. Must-read material. --Don Cannon has a Myspace page? --I don't know how to best describe this. You just have to view it for yourself. Deadspin introduces us to the 12-person beer bong. Someone with marketing savvy could become a millionaire from this idea. Rennie Stennett's Pirates were MY Pirates. Damn it!!! loved the Bee burning link. I once met Don Cannon in an establishment not to be named, and even threw down a few beverages with him. He was a great guy. I was 18 at the time. For what it's worth my dad's pirates were like the Waner brothers n'at. I love the day-by-day baseball season predictions. Gold: "September 20: Instead of facing Albert Pujols with the bases loaded in the bottom of the ninth inning, Astros closer Brad Lidge just turns around and throws the ball over the left field fence." I love the Don Cannon MySpace page, even if it's not really him. I remember watching part of his last WTAE newscast when he was drunk and just sat there. Sally Wiggins was not happy. Why do all media personalities in Pittsburgh drink heavily? LaRoche is definitely a Klopek. Just ask him what his brother does and he'll say in a very stern and abrupt voice, " You mean, The Docktor?" and I have on pretty good authority that the Don Cannon myspace page might be more of a "tribute" than it is authentic.